nickys*mommy has no other items for sale. Chipboard Letters. 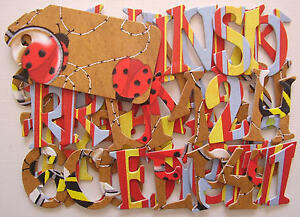 52 Piece Chipboard Letter Kit. Boys n Bugs. View All Letters Here. 48 Uppercase Letters. Complete Selection of Letters Here. Any combination of Uppercase Letters, Lowercase Letters, Numbers, & Punctuations. Free shipping on all eligible items from nickys*mommy. $0.25 shipping for each additional eligible item you buy from nickys*mommy.